Dear Lazyweb: Who is right g++ or clang? g++ compiles, clang complains that A::foo is protected and can't be used in C::useFoo.I know friendship is not inherited, but this is actually the reverse of inheriting, so does anyone has any pointer as to where i should open the bug? clang or gcc? A few days ago I decided to go to http://jointhegame.kde.org/ and "Join the Game". 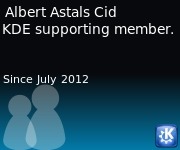 For those of you unfamiliar with the term it means i became an official supporting member of KDE eV by donating 25€ each 3 months. A membership card and a welcome gift (waiting for them, i just joined so still not here), the invitation to attend the annual general assembly of KDE e.V. (which doesn't mean much since i'm already a KDE e.V. member) and regular first hand reports about KDE's activities. That's cool and it's what the webpage lists as benefits, but I think the other huge benefit I get is that KDE has a more stable source of income (it's better to have 100 people donating 100€/year that one donating 15000€, because that one might decide otherwise for next year and you take a big hit). So if you like KDE and want us to keep doing development sprints, paying for the hardware, etc. you might want to Join The Game with me so we get a more stable source of income. Following our tradition, the KDE-ers of Barcelona (and anybody from anywhere that wants to drop by) will celebrate the release of 4.9 with a dinner. This time will be on 4th of August at 21:30 in the Hola Manito Restaurant in Gràcia. Of course everyone is invited to come and remember that if it's too far for you, you can always organize something in your own city, according to the KDE users map there is people around with a common interest!